Each Play & Learn L.A. Center has three sections. The first section will consist of a children and family area (Play Center) filled with engaging exhibits for children and their caretakers to play together in. The interactive exhibits will provoke a child’s imagination and inspire learning through active, developmental play. This component will be akin to the interactive “Children’s Discovery Museums” found in more affluent areas. The second component will be multi-use rooms for parenting and early-education classes and social-service oriented programming. Third, each Center will host a revenue generating gift-shop at the entrance foyer. The Galleries in the Play Center will create real-life experiences with authentic and detailed environments that will incorporate accessible and interactive objects. These real life objects and props enrich the play of the child and broaden their imagination as the simple props are transformed into hospital emergency room, grocery stores, outer space, the ocean, and a performance stage. Each Play & Learn L.A. Gallery will help children develop observation, critical thinking, creative play skills, cognitive, motor, social and literacy skills as well as engage in imaginative play scenarios. They will also introduce children to career possibilities such as doctor, nurse, paramedic, veterinarian, life guard, boat operator, police officer, actor, reporter and so on. Creativity Center & Re-Use Factory. Perhaps the heart of the Play & Learn L.A. Play Center, the Creativity Gallery provides an “Arts & Crafts Plus” experience missing from so many schools and children’s lives including painting, soft clay sculpturing and endless design projects all using re-used and previously discarded materials donated by local businesses and families. A Take-Apart Table will allow kids to dismantle donated everyday appliances and later incorporate those items into creative art projects. This Gallery will also compliment every other Gallery in the Play & Learn L.A. Center and related programming. For instance, the Creativity Center will allow families to create props for the Storytime Literacy Center’s stories and the Performance Stage productions. It will allow kids to build boats to float on Surf City’s ocean and to make planes to fly in the “Santa Susana Wind Tunnel.” Financial sponsors could include large art supplies stores, Lakeshore, Crayola, Dunn & Edwards, arts-focused foundations and other such entities. 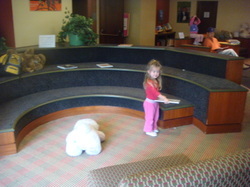 Storytime Literacy Center. This Gallery will be based on a popular children’s story with props bringing the story alive. Parents and staff will hold regular Storytime reading sessions and parents can explore books with their children in different reading nooks with comfortable couches. Various props to assist children in learning their alphabet in an exploratory mode will be emphasized. An integrated program with the Creativity Center and Performance Stage will allow visitors to read and listen to a story, create props based on the story and then act-out the story in short performances. Music and Dance Space. A mixed-use Gallery relying on programming to give children the opportunity to learn age-appropriate dances with a full-length wall mirror and ballerina bar. There will be an integration with the Creativity Center to build musical instruments from common, every-day items, classes in percussion and Latin American (home-made) instruments, group singing lessons and both drop-in activities as well as multi-week classes. There will be a heavy emphasis on teaching traditional songs and games that accompanied one another from different cultures. Various styles of dance will be taught with both drop-in impromptu classes and subscription classes available. Performance Stage. A stage for children to engage in impromptu acting, programmed mini-plays, and to watch guest performers will include an audience section for visitors to sit in and enjoy the show. This space will be adjacent to both the Literacy Gallery and the multiuse rooms which will both have retractable walls to accommodate performers who might attract a larger audience from the community. A puppet theater will be easily rolled onto the stage for both impromptu and programmed puppet shows. This space could also be used to hold mock city-governance meetings with a dais and table for VIPS for kids to explore civic government processes. Financial sponsors could include Fox, Warner, AMC and other entertainment giants. Totscape. Meeting the needs of the youngest visitors, the Totscape Gallery will allows infants, toddlers and preschoolers to safely crawl, climb, cruise and teeter over specially designed play mats, bumps, crawl spaces and other sensory-charged designs to stimulate motor activities, cognitive reasoning and other sensory skills. There will be a toddler activity table with an ever-changing assortment of artistic molding available including play dough, magnets, chalk, molding foam and other hand-on, hands-in materials to shape, contort and get busy in. Financial sponsors could include Nestle, First Steps, Parenting Magazine and other businesses aimed at the toddler world and their families. Community Health & Fitness Center. Bike-powered exhibits that rely on children and families to pedal in order for things to happen will encourage exercise and physical activity. Treadmills that place kids in video-enhanced destinations such as the Grand Canyon, downtown L.A. and the moon will encourage kids to run to their heart’s content. In addition, there will be other fun-inspired physical activities where movement is required for other actions to be initiated. Another component will include a doctors table that allows kids to measure heart rates before and after exercise; tests for lung-strength and other measurements that gives families a sense of their physical health will be part of this Gallery. Direct lessons on the positive results from fitness will teach families that positive exercise programs are vital to healthy lives. Financial sponsors could include Kaiser Permanente, Blue Cross, 24 Hour Fitness and other fitness or health concerns. Community Market & Nutrition Center. Children will have the opportunity to indulge in a favorite pastime—playing store. Here they shop for groceries, pretend to prepare food from the deli counter and become a chef with an emphasis on learning about healthy eating habits. Financial sponsors could include Food for Less, Ralphs, Jons and other food providing companies. Surf City. This Gallery will feature some of the best of the Southern California environment: beach, water, & rock climbing. There will be a rock wall built to look like Joshua Tree rocks with a belay rope system offering different levels of challenge. All children using the belay do so with an adult caretaker thus involving the parent into the play and providing a unique bonding opportunity as the child’s success depends on both parties working together. This Gallery will also feature a beach with sand to recreate life at the Southern California shores complete with a Life Guard station to climb and slide down and numerous role-playing opportunities. The sand will have buried treasurers (and maybe even fossils) to keep children and adults of all ages fascinated. Adjacent to the beach will be a tide pool with a very shallow section that kids can wade into up to their ankles as they explore the tide pool’s various discovery objects. A ½ sailboat to climb on, explore and engage in imaginative play will be moored at the beach. At a higher level will be a water table simulating an ocean tide that children can float small boats, play with plastic sea animals, use canal locks to change the tide, and clear the ocean floor of debris and items that pollute our precious resource. There will also be a real aquarium with sea creatures that can be touched with staff present at certain times of the day. The Creativity Gallery will give children a chance to build their own small boat out of wood or other materials in order to try it on the Surf City ocean. Financial sponsorship could include companies such as Coppertone, Cruise Lines, REI and other outdoor related companies. Port City & Construction Site. With a ship to unload at the port dock and buildings and cities to create, the Port City & Construction Site will keep families busy as they cooperatively play with large and soft building blocks, small wooden blocks, use cranes, buckets, cranks, a kid-powered conveyer belt, pulleys and wheelbarrows to get the building materials from the ship to the city for building towers and the “Build A House” section. Wooden train tracks can be assembled from the Port to the City to move materials with the miniature push-train set. Blocks, construction paper, cardboard and other materials can be glued, painted and shaped in the Creativity Gallery to be used in the Port City & Construction Site. Financial sponsors could include the L.A. and Long Beach Ports, Lego, shipping companies, construction companies, architectural firms and other such companies. Santa Susana Wind Tunnel. Visitor operated propellers and fans can be explored to see the effects of wind. A paper airplane runway will give families an opportunity to test differently designed paper and plastic airplanes that they created in the Creativity Center with hoops for accuracy and measuring tape for distance available to create a game environment. Rubber-band propelled airplanes created by the Center will also be available for play. A platform with plexiglas walls built over large fans can create a vertical wind tunnel that blows all types of materials partially secured onto the walls that will then float through the room, and when the fans stop, these materials will float back down; the kids will then fit each shaped-item back into its own place having to solve the puzzle-like placement challenges all the while learning about wind, force, gravity and cleaning-up! Financial sponsors include companies such as Boeing, United Airlines, Institute of Museum & Library Services, and energy-giants who have wind-generated power such as Edison, among others. Vet & Pet. Children will learn how to take care of a variety of animals with different exhibit centers in the Vet & Pet Gallery including feeding stations, grooming stations, animal tricks stage, x-rays and examining station, and a kennel and sleeping quarters for the animals. The Gallery will be filled with various stuffed animals, including some with repairable injuries. Relationships with local pet stores or animal habitats ranging from the Zoo, to Star Eco Station in Culver City, to animal rescue places will be created for occasional live animals to be brought to the Vet & Pet Gallery. Volunteers from local veterinarian hospitals will be sought to enhance the experience for children and their families. Financial sponsorship could be sought from companies such as PetCo, Purina, local for-profit veterinarian hospitals and other animal related companies. Moonscape and science room. A springy moonscape that recreates iconic images of the moon’s surface will allow kids to jump around like an Astronaut will be the main attraction of this Gallery. Pretend-telescopes with images of the solar system and planets will give kids access to the wonderment of the sky above them, even in an enclosed building during daylight hours. Other fun and simple science experiments will keep kids and their families busy in this Gallery. Financial sponsors could include NASA, Boeing, and other science and space oriented concerns. Post Office. Kids will be placed in a mock-mail sorting room to have their chance to ensure packages and letters are delivered on-time to the right place, affix stamps, and prepare packages. Packages will be color-coded with a world map so that kids are exposed to geography. A post office vehicle (or UPS truck etc. depending on the financial sponsor) will be stored there for kids to explore and play role-playing games. Work on the packages and letters can also be done in the Creativity Center to create works of art the children could take home in order to continue their fun after their visit. Financial sponsors could include UPS, Federal Express or other delivery companies. Media Center. Kids will have a chance to be behind, and in front, of real television cameras. Programming could include making the news with anchors and meteorologists, producing commercials, and engaging in oral history projects to record views on their community’s needs and a Living Memories program to record multi-generational family histories. Filmed sessions can be uploaded onto the Play & Learn L.A. website and be a treasured family multi-media memento. Financial sponsors could include Time-Warner, Fox, Telemundo, Verizon or other media companies. Community Partner Space. Los Angeles is blessed with the Natural History Museum and California Science Center. Because these institutions are not easily accessed by all residents, they have developed travelling programs. These programs can be easily adapted for use in a small Gallery inside a Play & Learn L.A. Center. We have had initial discussions with both museums who have expressed interest in doing community outreach by placing their exhibits in our Center. 2. Digital video-booth to record participants experiences into at PLLA and views on their community’s needs. 3. Mock city-council dais and tables/chairs. 1. Revenue generating gift-shop at the entrance foyer. 2. Lending Library (if partnership with public library system could be created). 3. Wall design & window-space reserved for local children’s art or other relevant play artifacts. 4. Size-appropriate features for small children such as smaller doors, crawl-spaces and even family restrooms with children-size facilities. Galleries will be linked through tunnel and other fun alternate entrances. 5. Multiple resting and observation opportunities for older or tired family members. Are there programs not listed above that should be part of Play & Learn L.A.'s offerings? Please let us know by commenting on this post.